October 6 - 7, 2014, AARP Building, Washington, D.C. The 2014 AARP Network of Age-Friendly Communities Conference was an opportunity for community representatives and AARP staff to share valuable experiences, advice and training. The conference was organized by Jeanne Anthony, project advisor, AARP Education & Outreach, Livable Communities. Jennifer Wallace-Brodeur, senior advisor, AARP Education & Outreach, Livable Communities, served as the event's moderator. During the conference community representatives and AARP staff worked together to discuss common issues and approaches to supporting the age-friendly efforts in their communities. Specific questions and topics were identified and after the discussions the groups reported out on best practices, processes, solutions and tips to serve as guidance for others as they encounter similar situations. The Community Roundtable Discussions (PDF) document is a summary of those talks and tips. In addition, you can find a list of some of the conference presenters and download their presentations below. Paul McGarry, senior strategy manager for Age Friendly Manchester in Manchester, England, gave a presentation about Manchester’s experiences with the World Health Organization Global Network of Age- Friendly Cities and Communities. McGarry focused on key features of a successful age-friendly community, including political context, volunteer engagement and funding. Kent Sovern, AARP Iowa state director, spoke about how to build age-friendly business partnerships and how an age-friendly business certification program in Des Moines helps businesses better serve all customers. Sovern shared his experience in making the case for age-friendly businesses and recruiting a team. Jerry Cohen, AARP Oregon state director, spoke about Portland’s age- friendly business initiative. The program is designed for a wide range of businesses, not just organizations that focus on senior services. Cohen talked about how organizations are engaged at all points of the program from certification to relationship to awareness. Lee Sobel, director of public strategies for RCLCO, presented a preview of the Livable Communities Business Case. Sobel discussed how livable communities generate higher tax revenue, create economic output, provide new businesses and jobs, and increase property premiums. 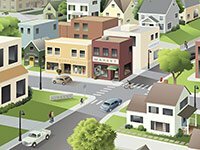 Sobel used real life examples from urban, rural and suburban areas to showcase the economic benefits of livable communities to businesses, residents and the community. John Feather, Ph.D., CEO, Grantmakers in Aging, discussed how to apply for grants. He explained the differences between corporate, foundation and government funding. Feather suggested that age-friendly communities build relationships with local funders who have a similar mission to the age-friendly initiative. The presentation stressed that writing the grant should come last; relationship building, advertising your success and researching the organization needs to come first. Margaret Neal, director of the Institute of Aging at Portland State University, talked about the evaluation process for an age-friendly community, having recently completed an evaluation guide for communities to use with their evaluation process. Neal notes that in addition to assessing a program's effectiveness, evaluation helps communities attract supporters who are not yet involved, gain a better understanding of how to focus efforts, allows them to share their experiences and inspires momentum. She stressed the importance of measureable and meaningful indicators. Jennifer Campbell, national evaluator for the EngAGEment Initiative with Grantmakers in Aging, discussed her work on evaluating five communities where Pfizer is doing age-friendly work. Campbell discussed four pillars for successful age-friendly initiatives, which include engaging the public, building public will, contributing to building the infrastructure to advance age-friendly work and work across sectors. Bob "Hoff" Hoffman, a retired, former AARP Regional Director turned AARP volunteer, spoke about engaging volunteers in the age-friendly initiative. Hoff discussed a document, created by AARP Education & Outreach and the AARP Office of Volunteerism and Service, that looked at volunteer roles in age-friendly and livable work. Volunteers, he explained, bring credibility as members of the community, offer issue expertise and have knowledge of the community’s history.